This serene terrace, by Bernard Trainor, is a fine example of the ideal modern landscape—the good life lived to a great degree out of doors. 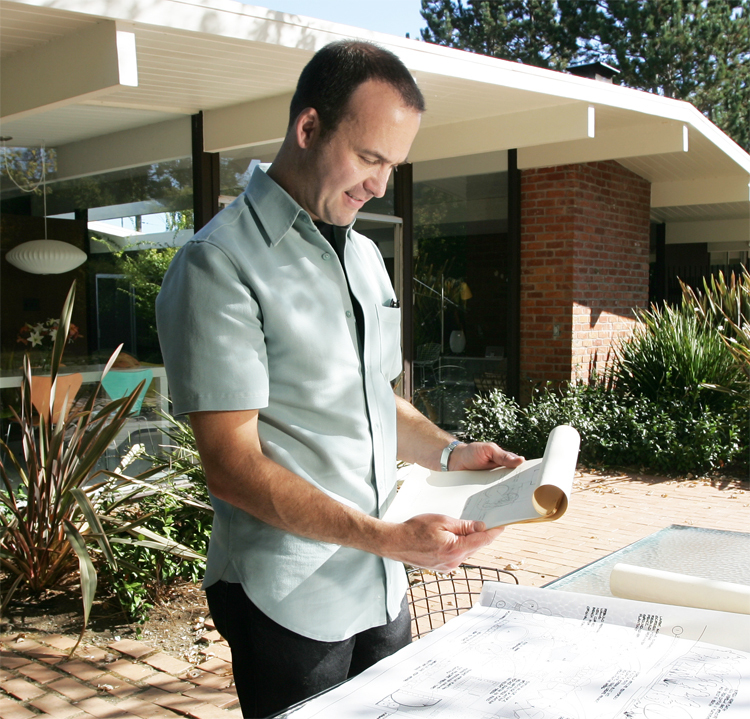 Landscape Architect JC Miller at work on a plan for an Eichler garden restoration. Miller's recent restoration and design for Eichler's former office building in the Edgewood shopping center, Palo Alto. 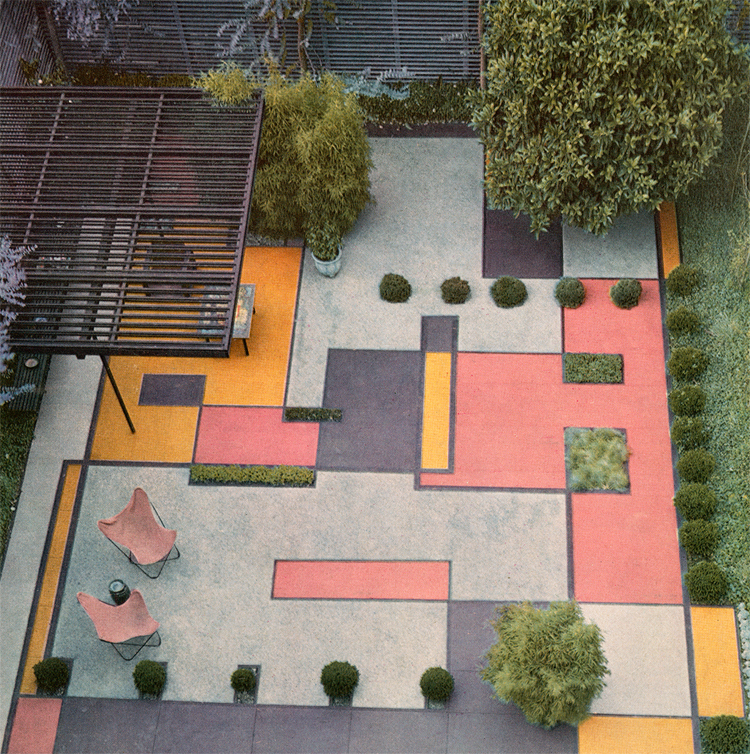 The strong influence of modern art on postwar landscape architecture is clearly visible in the Chinn Garden, in San Francisco, a 1950 design by Robert Royston. The emphasis on outdoor living was a shift in mindset from early turn-of-the-century building and gardening, when landscapes were something pretty to look at or stroll through. A turn-of the-century home may have had doors that led out to a terrace or a set of picture windows that looked out over a garden, but there was no direct access point to get you out into the garden. There was a distinct separation between indoors and out. 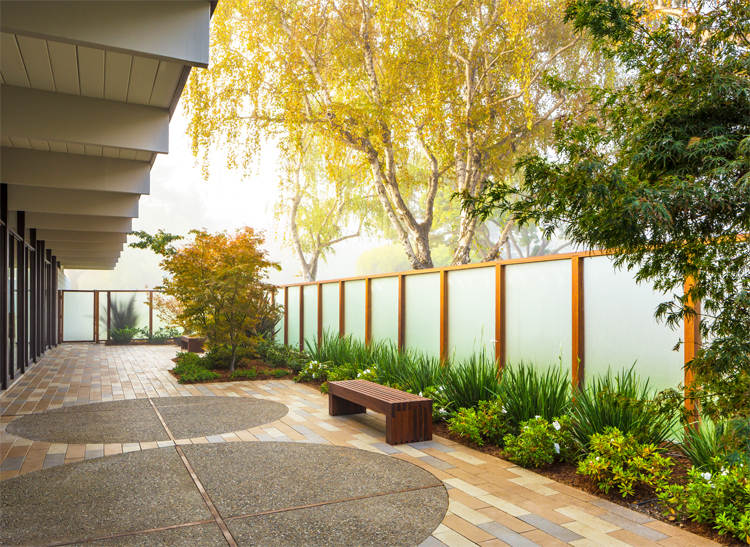 "Mid-century modern landscape design was more focused on usable spaces and direct connections," Miller says. "They were beautiful but less fussy." Landscape architecture, like much of American culture, changed in a big way in the postwar period. The influence of global styles after the war, especially the spare minimalism of traditional Japanese design, can clearly be seen in the buildings and gardens of the period. The sculptural form of Bonsai trees, the gravel and stone of Zen gardens, and controlled but natural arrangements of plants found in Ikebana, the Japanese art of flower arrangement, all begin to appear in the mid-century garden. The popularization of modern art, especially abstract painting, was another strong influence on designers of the period. "Some interpretations of modern art in the landscape were really amazing, and awful, but in all cases the designers were trying to expand the language of the garden and make abstractions in the landscape," Miller says. A successful example, Miller points out, that incorporated modern art into the landscape was the Chinn Garden, which was located behind a four-story apartment building in San Francisco. Intended to be viewed from above, this 1950 design by Robert Royston used striking colored concrete and the forms of a Mondrian painting—lines in combination with various square and rectangular shapes—to create abstract art on the ground. "I don't think that the literal translation of art technique is quite as important in garden design today, but this was a big deal to the generation of landscape designers that worked originally on MCM homes," Miller says. 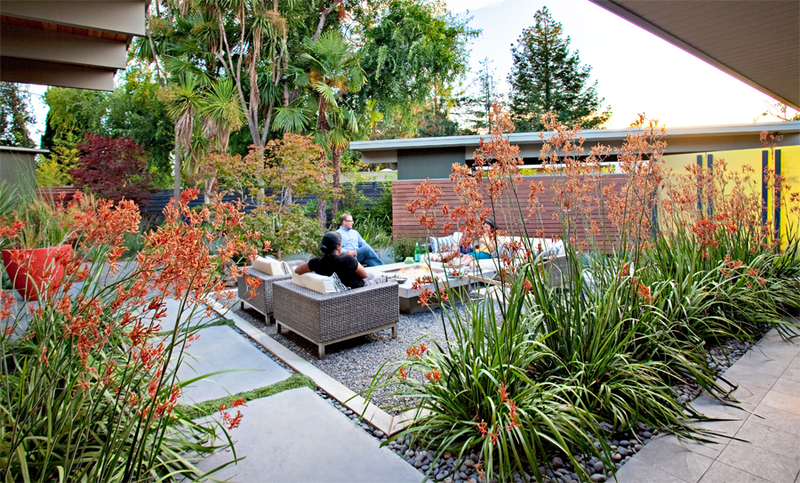 Unlike with traditional homes, where plantings tend to hide the foundation, "in a modern house you want it to appear as if the floor runs out into the ground plane of the landscape," he says. With today's contemporary landscapes, the focus is on treating the outdoor space as a true complement to the house, with designated outdoor spaces for lounging, dining, exercise, and play. It is not unusual to see meditation gardens that are also used for yoga, herb gardens that complement outdoor kitchens, and small guesthouses or home offices next to the backyard pool.